The Game of Chess has been around for well over 1,000 years. It is without a doubt one of the best board games ever created. But finding a place to leave a chess set displayed and finding time to play the game can be challenging. The Patented Straight Up Chess boards are perfect for today's busy lifestyle. The chess board tiles become the back drop to the chess pieces sitting on narrow acrylic shelves and the decorative frame adds the finishing touch to add a little fun and decoration to any home or office. The chess board is off the table, out of the closet, out of the way and beautifully displayed on the wall. Let the game begin! chess pieces out of walnut and cherry. The Kings are 11 inches tall. You can move the chess pieces around the board without leaving your chair using hooked sticks, turned from walnut and cherry. The table takes up a lot of room and I have searched for a place to display it many times. It has been in my home, my office, offices that belong to others and at times in storage. I considered taking the legs off the table, mounting the board on the wall and putting shelves to the side of the board to display the chess pieces. Then while sitting on eternal phone hold, I envisioned how that chess set would look on the wall, and it hit me, “What if I could put it on the wall and still play chess?". In that instant, Straight Up Chess was born. Straight up chess boards are called a lot of names, beautiful, artistic, decorative, brilliant, classy and fun but the most consistent thing I hear from my customers is "The best conversation piece EVER". A one of kind decoration but functional Art and decor for any office, man cave, hallway, bedroom or any room in the house. Why are the Straight Up Chess Chess Boards Rectangle in shape? Just like flat boards (you know the old fashioned kind) are square because they are designed around the base of the chess pieces, Straight Up Chess boards are rectangle because they are designed around the profile of the chess piece. The rectangle shape is also a better design for the wall. I know it looks a little strange at first, but make a couple moves and you’re on your way. The angles are a little different and that may take a game or two to get used to. Manufacturing: The boards are manufactured in my Omaha, NE shop and guaranteed not to warp or crack. The acrylic shelves can be removed for cleaning and replaceable if damaged. The acrylic will vary in thickness from 10 to 12 thousand, so they are sorted by thickness and then the slot is cut in the board within 1 to 2 thousand to give the best fit. Move Markers: Every Straight Up Chess board comes with move markers for 'Last Move' and 'Check / Checkmate' as shown here. Hanging the boards: The Straight Up Chess boards hang on the wall just like art. They come with a 60-pound D-ring hook on the back of the board . A wall hook designed to hold 50 pounds in drywall is included with every board. The boards with chess pieces will weight from 13 to 19 pounds depending on the weight of the frame and the chess pieces. I normally put two hooks on boards with heavy metal sets and for oversized custom boards. If you prefer two hooks for hanging, just let me know and I'll set it up that way. 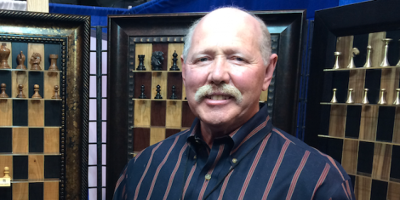 Sizes: Straight Up Chess boards are made for chess sets from 2" to 4.5" based on the tallest chess piece. The standard size is a 3" board. The spacing between the shelves on a 3" board is 3.25" to allow room to move the 3" chess set. On a 4" board the spacing is 4.25, etc. The width of the tiles on a 3" board is about 1 7/8". For every 1/2" you add in chess piece height, add 1/4" to the width of the tiles. For example, on a 3.5" board, the spacing between the shelves is 3.75" and the width of the tiles is 2 1/8". In regards to the overall size of the boards. It depends on the width of the frame but as a rule of thumb, the overall size of a 3" board is 22x34". For every half inch you add in chess piece height, add 4" to the board height and 2" to the width. I know this can be confusing. If you need help, call or email. The 3" boards, some of the 2.5" sizes and some 2" size boards are pre-made and ready to go. The larger boards over 3" are custom orders and I normally need 2 to 3 weeks to get those done. If you are designing a board for your own chess pieces or one of my sets. Here are a few things to know. Metal and colored theme sets will look good on just about any board back ground. When I refer to the type of wooden sets, I normally refer to them as Black, Rosewood or Golden Rosewood. I'm referring to the color of the dark side. The light colored side is almost always Boxwood. When designing a board for a set of chess pieces, you want the pieces to stand out well against the board. I would avoid putting black or ebony sets against a black background, same with red against red or brown against brown. There maybe an exception now and then. In most cases I will guide you to what chess pieces to use with which board. If you have questions, call me.